The United States has been spying on German Chancellor Angela Merkel's mobile phone since 2002, according to a report in Der Spiegel magazine. 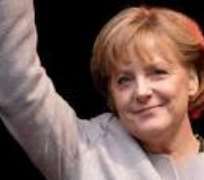 The German publication claimed to have seen secret documents from the National Security Agency which show Mrs. Merkel's number on a list dating from 2002 - before she became chancellor. BBC reports that her number was still on a surveillance list in 2013. Meanwhile Washington has seen a protest against the NSA's spying programme. Several thousand protesters marched to the U.S Capitol to demand a limit to the surveillance. Some of them held banners in support of the fugitive former contractor Edward Snowden, who revealed the extent of the NSA's activities. The nature of the monitoring of Mrs. Merkel's mobile phone is not clear from the files, Der Spiegel says. Germany is sending its top intelligence chiefs to Washington in the coming week to 'push forward' an investigation into the spying allegations, which have caused outrage in Germany. On Friday, Germany and France said they want the U.S to sign a no-spy deal by the end of the year. As well as the bugging of Mrs. Merkel's phone, there are claims the NSA has monitored millions of telephone calls made by German and French citizens.